The B&LE was completed in 1897. But the date on the Plum Creek tunnel, whether 1937 or 1957, indicates changes from the original construction. 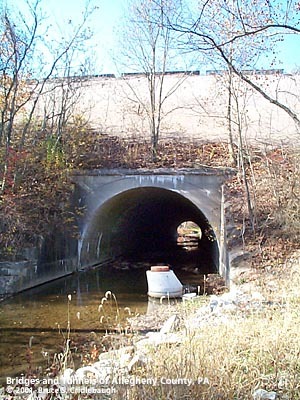 Also the nearby Pennsylvania Railroad tunnel through this embankment carried the Plum Creek Branch. 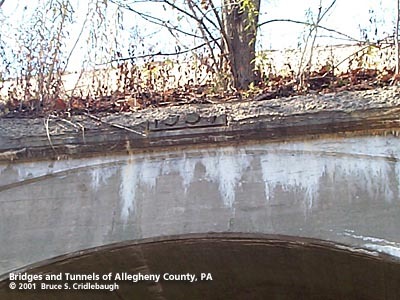 That branch was contructed by the Allegheny Valley Railroad Company in 1872 and extended to the mines at Renton after 1903. 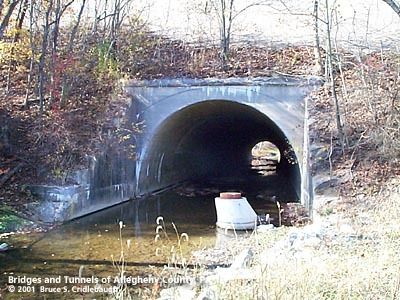 The PRR tunnel is similar in design to a 1924 structure on the Peters Creek Branch. In some locations, railroads would cross valley like this one at Plum Creek on a high trestle to complete the line -- then return to strengthen or replace the temporary structures. The B&LE replaced its 1897 high bridge over the Allegheny River in 1918; a large part of the approach trestle on the northern end was buried by an embankment. Perhaps that is what occurred here.